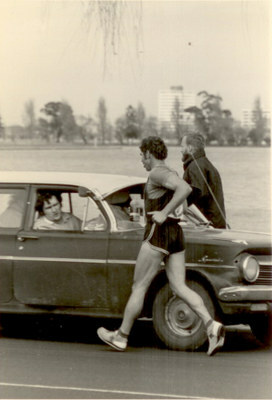 Allan Minter joined Collingwood Harriers in October 1962, thus starting a long career, first as an athlete and then as an administrator. Soon after this, he joined the Victorian Amateur Walkers’ Club and started competing in our races at Albert Park. I remember walking against Allan many times in my younger days, including the 1968 Melbourne to Frankston 25 Mile Classic, when we were both off first in the handicap start. By memory, I stopped at 15 miles but Allan went on to finish. Allan joined the VAWC Social Committee in 1967 and soon became an enthusiastic fund raiser for the club. He was one of the main forces behind the mini-Tatts tickets which raised a lot of money in the late sixties. In 1976, Allan (as Secretary) and Ray Smith (as President) took over the club leadership after the death of Alf Robinson and, together, they guided the club into its most successful era ever. The weekly race fields grew larger and their depth became the envy of other States. More women started to race at Albert Park and Victoria dominated the national scene with the likes of Ross Haywood, Willi Sawall, David Smith, Tim Erickson, Sue Cook (Orr), Sally Pierson, Lorraine Jachno (Young), Andrew Jachno, Michael Harvey, John Sheard and Bill Dyer all coming to the fore and representing Australia. Allan took on the burden of a massive club workload on top of regularly working two jobs (with his career as an insurance assessor with Eagle Insurance and with his taxi driving). His energy seemed limitless and somehow he was able to keep up with it all and manage to still bring up his family of young children. 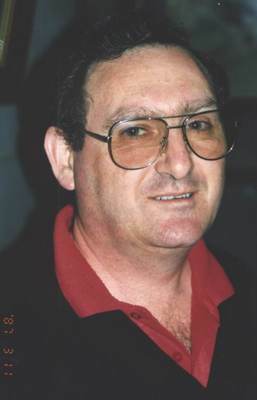 The annual trips to Canberra saw Allan organising a bus and hotel accommodation, making sure that the strongest possible VAWC team represented the club. Then in Canberra, he spent the Sunday looking after everyone in the various races. These trips are still remembered with great fondness by all those who participated. His old station wagon was a regular sight at Albert Park. Allan used to park it at the start/finish line in front of the clubrooms and use it as his base as lapscorer and race marshall. Like Alf Robinson, he was able to manage a large sheet of walkers and never miss a lap time. And there was always Vin Meade who was so deaf that Allan had to write his time on a chalk board and hold it up for him as he walked past. On many occasions, Allan was the sole official but he was never one to complain or fold under the pressure. Within a few minutes of race finish, the full race results would be pinned up on the club notice board with handicap and fastest times placings already completed. With Allan as Secretary, the annual report was a large document which minutely detailed the club’s activities for the previous 12 months. And in those days, it was not a simple job with a computer and photocopier. It all had to be typed on the club typewriter and then duplicated with an ink based gestetner copier. Allan was a great fundraiser for the club. The telephone book deliveries were a huge organizational effort in the mid seventies. Allan would meticulously plan the street deliveries and a mass of cars and vans would converge at the clubrooms and sally forth armed with maps and delivery instructions. 1979 saw the first ever Australian team sent to the Lugano Cup and Allan was involved once again in raising money to support the walkers who had been selected (most of them were VAWC members). His contribution to the club as an official extended from 1966 to 1984 – a period of 19 years. In 1984, Allan moved on from the club, with a young and growing family and with ever increasing work commitments. But his commitment to Collingwood Harriers continued. Over the years he served as President for 7 years, as Vice President for 7 years and as canteen officer for 19 years, along with other key club positions. He was awarded Life Membership of that club in May 1982. He also continued his long association with Athletics Victoria, serving as an AV official for many years. His work was recognized when he was amongst the Athletic Victoria Merit Award recipients in 1998. Now retired, Allan and Suzanne live in Armstrong Creek, just south of Geelong. At the 2018 VRWC Annual General Meeting, Allan was awarded life membership, a fitting and long overdue recognition of his many years of service to our club.